We have our 2nd qualifier for Nook giveaway. 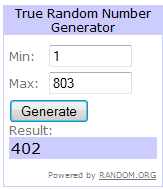 It is #402 – Bianca S.
Congratulations Bianca! You now have a 1 in 7 chance to win the Nook on Sunday! Grand prize winner is: ?????????? You still have five more days to qualify to win the new NOOK 7″ Tablet so be sure to sign up for the once a day e-Mail for a chance to win it this Sunday! ← An afternoon chat with “The Frugal Travel Guy”!